Spring is officially here and that means a mixture of sunny days with temperatures in the 50’s followed by late season spring storms bringing snow fall to the summits and dustings at Lake level. Don’t make the common mistake and wait to purchase your season pass when rates are highest in the Fall before the season starts. Do as the locals do and get your end of season turns in for FREE this year while locking in your season pass for next year at Lake Tahoe ski resorts at the guaranteed lowest prices of the year. Check out the best season pass deals at Lake Tahoe ski resorts in more detail below! 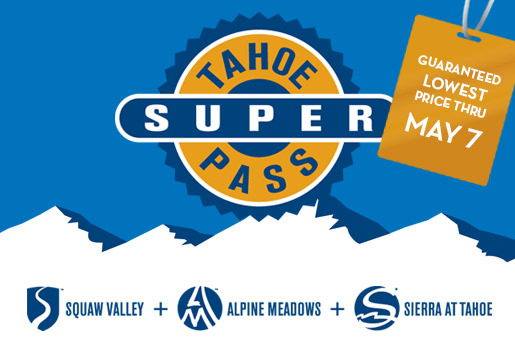 Squaw & Alpine’s Tahoe Super Pass – Squaw Valley and Alpine Meadows have announced their end of season 2013-2014 Tahoe Super Pass special that offers tons of specials if you buy your pass before May 7th. With purchase of the early season pass you will receive perks valued over $2,000 including: FREE spring skiing and riding beginning on March 31st until the end of the season, friend and family discounted tickets and the guaranteed lowest season pass price to Squaw Valley, Alpine Meadow and Sierra At Tahoe. Mt. Rose Adult Unlimited & Beginner Passes – Mt. Rose has announced two 2013-2014 spring passes including the Adult Unlimited Pass at $399 which provides unrestricted access to the mountain for the rest of this season plus all of next year’s season with NO blackout dates! Also, if you are begininger Mt. Rose is ready to teach you! With a special Beginner Pass for $149.00 which offers lift access to beginner chairs, free group lessons and free rental equipment to guests 11 years+ you will be a pro in no time. What a deal! Epic Spring Passes – All three Lake Tahoe Epic 2013-2014 season passes are now on sale so put your deposit down to guarantee the best pricing for next year’s season pass. Vail Resort’s season passes include the Tahoe Value, Epic Pass or Tahoe Local Pass which offer a variety of mountain access to best suit your needs. Put your $49 deposit down by April 14th and receive six Buddy Tickets for next season along with 2013 summer hiking access at Northstar California, Heavenly and Kirkwood. Or, if you pay for your 2013-2014 season pass in full receive one free day of skiing this season as well as the six Buddy Tickets and summer activity mountain access. Choose which works best for you! Soda Springs Season Passes – Located near Donner Summit, Soda Springs has also announced its 2013-2014 passes with a few extra specials to go along. Purchase your 2013-2014 pass by TODAY you will have access for the rest of this season in addition to next year. Or, put down a $49 deposit before April 14th and you will be guaranteed the lowest price for next year’s season pass. Child season passes are only $99 and including free tubing and Planet Kids activities. Remember Soda Spring passes also grant access to Boreal Mountain Ski Resort on select mid-week dates! In addition to the season pass specials above, ski resorts in Lake Tahoe are begining to offer daily lift ticket price specials as the season winds down and mountain access reduces. Be on the lookout for these specials on ski resort websites. Lastly, if you are interested in learning more about the ski resorts in Lake Tahoe check out my previous blog post Pick Your Peak. Are you ready to take advantage of one of these spring season pass specials? If so, share in the comments below which season pass you want to purchase. Enjoy learning about Lake Tahoe? Follow my blog and me at @robinpenning to receive information on tips, news, activities and special events in Lake Tahoe. Easter in Lake Tahoe is a very unpredictable holiday. During the past three years I’ve been living in Lake Tahoe two were spent skiing on the mountain while last year I was BBQing on the beach with friends soaking up warm springtime weather. Easter can be a tough holiday for local families and visitors to plan for in Lake Tahoe. With forecasters predicting tomorrow will be mix of snow showers and rain at lake level while snowing on the summits, it’s best to be prepared for Easter Holiday events both indoors and outdoors. Here I want to share some of the best Easter Holiday events and activities for your celebration tomorrow! 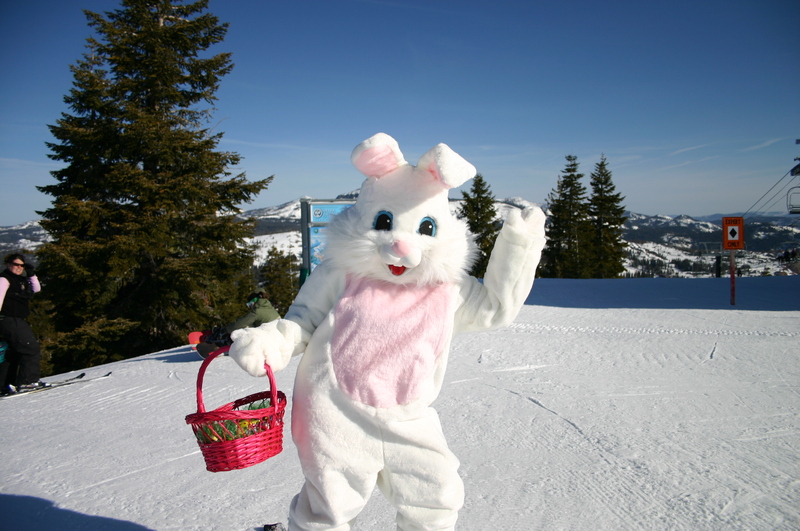 All-Mountain Easter Egg Hunt & Kids Easter Egg Hunt at Alpine Meadows – Alpine Meadows adult guests will search the mountain amongst hundreds of hidden eggs for one golden egg containing a Bronze Season Pass in the free Adult Easter Egg Hunt. The all-day hunt will begin when lifts open at 9 a.m., and last until 4 p.m. For Kids there will be two separate Easter Egg hunts depending on children’s ages. Families meet at the Kids Camp Magic Carpet at 10:15 a.m.
Easter Eggstravaganza at Homewood Resort – Giant Eggs will be hid all over the mountain at Homewood and guests will redeem fun prizes at the North Lodge between 9am-1pm. Included in the prizes is a Golden Basket with a Season Pass for 2013-2014! A Mini Egg Hunt for kids will be filled with candy and one lucky mini egg will have a grand mini prize along with visits from the Easter Bunny. Easter Egg Hunt & PEEPS Diorama Contest at Northstar – Northstar California will host an Easter Egg Hunt in the Village at Northstar starting at 10:30 a.m. with a special appearance from the Easter Bunny. The Easter Bunny will also travel throughout the mountain hiding golden eggs that will contain a variety of prizes. The festivities conclude at 4:45 p.m. with a parade through the Village lead by the Easter Bunny and Northstar Ski & Snowboard School mascot Ripperoo. Or, you may be planning to stay inside tomorrow with your family to celebrate and if so Brunch is the only way to go! 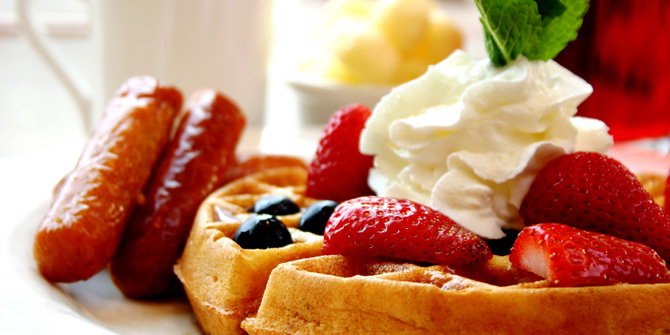 Restaurants around Lake Tahoe are hosting decadent brunch buffet’s to satisfy your holiday cravings with all the fixings. Reservations are recommended, but often restaurants will accept walk-ins but there likely will be a wait so be prepared to be patient. Easter Brunch Buffet at Jake’s on the Lake – Jake’s on the Lake will be serving an Easter Sunday Brunch Buffet from 10 a.m. to 2 p.m. Cost is $29 per adult and $14 per child age 10 and under. Kids may even find a few Easter eggs and adults can indulge at the Bloody Mary bar! 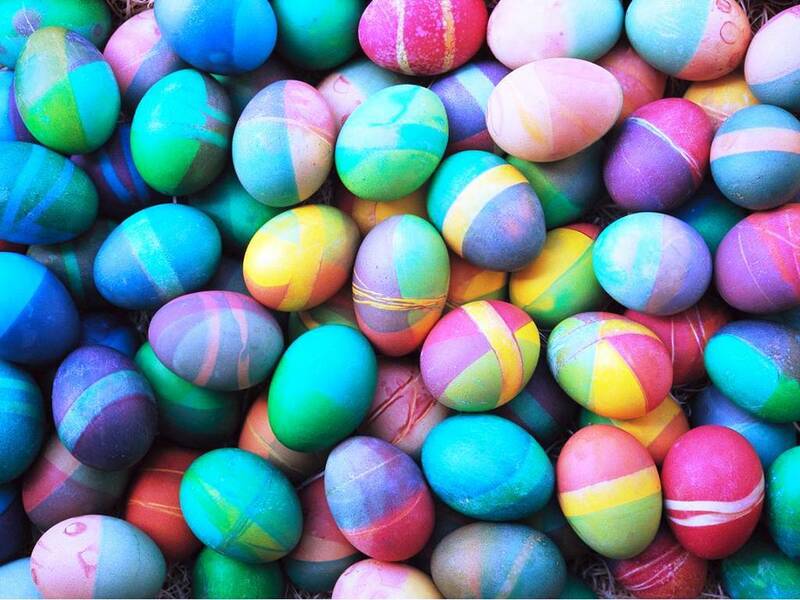 Easter Brunch Buffet at the Resort at Squaw Creek Easter – Cascades Restaurant at the Resort at Squaw Creek will serve an Easter brunch from 11 a.m. to 2 p.m. Adults are $45, children are $21. Easter Brunch at the Lone Eagle Grille – Easter brunch at the Lone Eagle Grille will be served from 10 a.m. to 2 p.m. Adults are $70, children 5 to 12 are $35, 4 and under are free and there will be live entertainment along with beautiful Lake views! Share what your favorite way to celebrate Easter is in the comments below! I have been visiting Lake Tahoe since I was born and I grew up experiencing what makes Lake Tahoe famous. From learning to ski, swimming in the Lake and going backpacking in the mountains, I learned firsthand about this amazing destination. However, like many I only had a surface level understanding of its history. In this post, I will share with you some background on how Lake Tahoe was formed, settled and some fascinating facts about it! Lake Tahoe was formed by a series of faultings that formed the mountainous basin and peaks surrounding the Lake. Eruptions from the extinct volcano Mount Pluto formed a dam on the north side of the lake in which melting snow later filled the southern and lowest part of the basin followed by rain and runoff water. Lake Tahoe was finally shaped by glaciers during the Ice Ages, which began a million or more years ago. 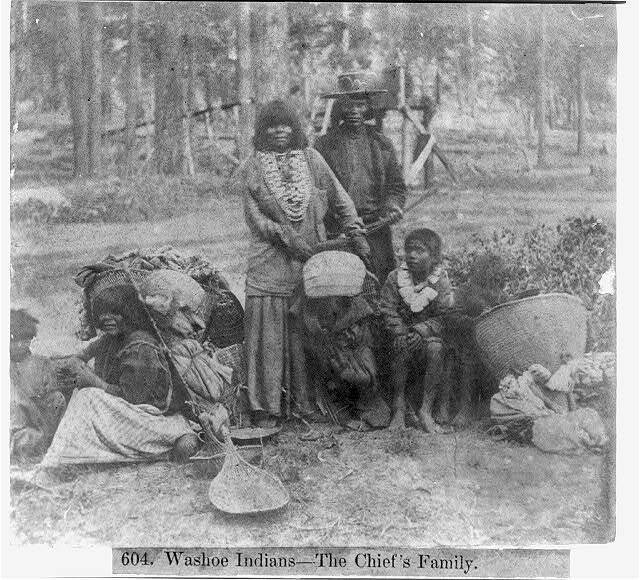 For centuries, the Lake Tahoe basin was the summer gathering place for the native Washoe Tribes who hunted and fished along the shores also famous of basket weaving. The Washoe named the area “Da-ow-a-ga,” or “edge of the Lake.” Early explorers unfamiliar to their language interpreted the phrase as “Tahoe” and in 1945 the Lake Tahoe Basin was officially designated. First pioneers explored the area in the 1860s when silver was discovered in the Sierra Nevada Mountains. They came to the area during California’s Gold Rush, planning to strike it rich as the largest silver lode was discovered nearby in 1859 in Virginia City. Also, Tahoe’s timber forests became an important resource as fuel and also to support the labyrinth of mines being constructed nearby. The availability of timber led to the near clear cutting of Tahoe’s forests, which were heavily logged between 1860 and 1890. By the turn of the twentieth century, news of Lake Tahoe’s natural beauty had reached the wealthy families of San Francisco who sought a new vacation destination. 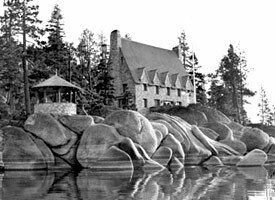 Many mansions of historical significance line Lake Tahoe’s shores today as a result of this era including the Thunderbird Lodge on the East Shore, Vikingsholm the original settlement on Emerald Bay and The Ehrman Mansion in Sugar Pine Point. In the mid 1940’s, gaming establishments, permanent accommodations, hotels and roads were constructed. Following the 1960 Winter Olympics held at Squaw Valley, Lake Tahoe was solidified as the premier skiing destination of the western U.S.
Lake Tahoe lies along the borders of California and Nevada and is not governed by any single entity but rather by a handful of different bordering counties. The Tahoe Regional Planning Agency (TRPA) formed in 1968 is a bi-state agency between California and Nevada that is responsible with environmental protection through land-use regulation and planning. 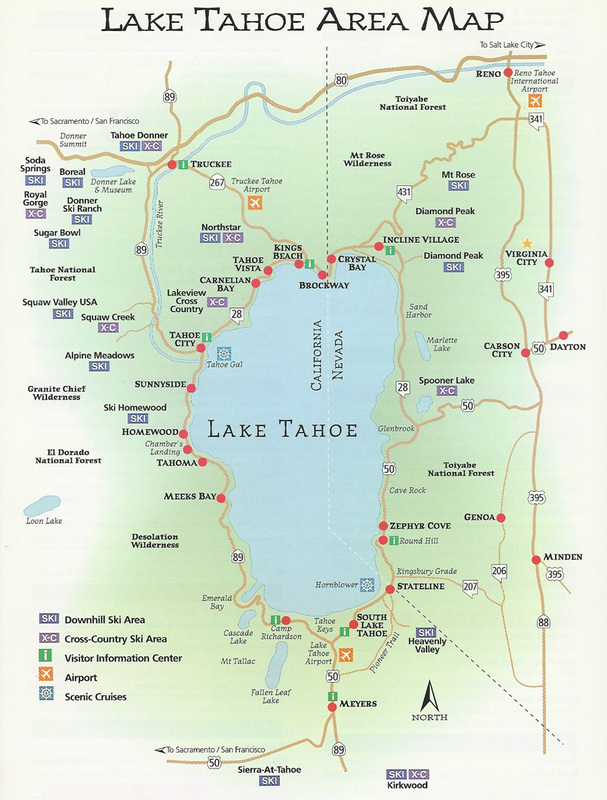 Lake Tahoe Trivia – Did you know? • There are more ski lifts in the Lake Tahoe Basin than in the entire state of Colorado. 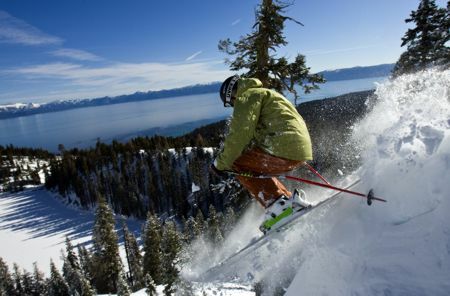 Visit Pick Your Peak to learn more about the Ski Resorts in Lake Tahoe! I invite you to share your own historical tale or trivia of Lake Tahoe in the comments below! Enjoy learning about Lake Tahoe? Follow my blog and me at @robinpenning on Twitter to receive information on tips, news, activities and special events in Lake Tahoe. When I moved to Lake Tahoe three years ago I had never been on a snowmobile and honestly I really didn’t have an interest to. I shared the notion that snowmobiling was only for speed addicts and thrill seekers, mostly young guys in their teens and twenties. Then, I had the opportunity to take my first snowmobile adventure with Lake Tahoe Snowmobile Tours and boy, was I proven wrong! I learned that snowmobiling is a great, family-friendly and group activity that can be enjoyed by people of all ages and level of adventure seekers. 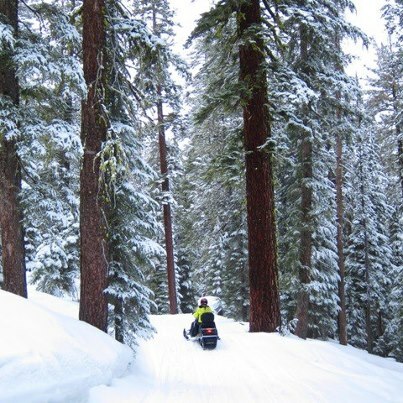 I especially learned that snowmobiling is also one of the best ways for non-skiers and non-snowboarders to explore the Tahoe National Forest during the winter. From the seat of a snowmobile, riders enjoy the treasured high altitude views of Lake Tahoe and surrounding basin that is usually accessible only to those on the ski resort summits, slopes and chairlifts. Here I want to expose you in particular to the great services of Lake Tahoe Snowmobile Tours who originally introduced me to snowmobiling and has taken well care of me ever since. 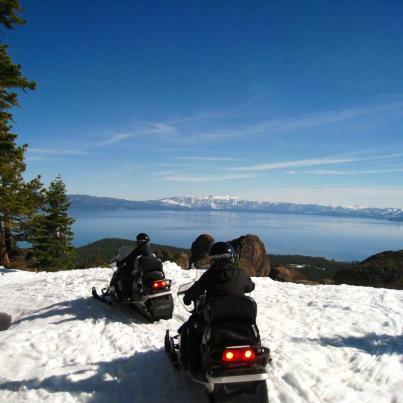 Located at the top of Brockway Summit on Highway 267, Lake Tahoe Snowmobile Tours has over 25 years of experience and access to over 100 miles of trails in the Tahoe National Forest that offer guests spectacular views of Lake Tahoe. It is also known for having the largest fleet of newer snowmobiles on Lake Tahoe’s North Shore and offers three tours daily including personalized private snowmobile tours all with your own local tour guide. 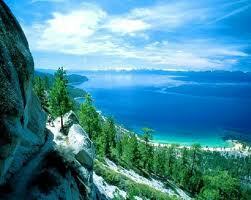 Their tours offer the best views of Lake Tahoe including a view of the entire Lake from the top of Mt. Watson at an elevation of 8200 ft. along with views of Northstar California, Squaw Valley and Alpine Ski Resort. Besides views, tours include a visit to Watson Lake where riders are able blow off steam and let the snowmobiles loose while speeding around the lake in a race track pattern. Tours also include an otherwise inaccessible climb up the steep backside of Mt. Pluto to its summit at Northstar California and ascend on The Summit Deck & Grille perfect for après hot beverages. My local tip – arrange a private tour! Private tours allow you to get the most out of your experience and time. Also, the guides at Lake Tahoe Snowmobile Tours are experts on the surrounding area and enjoy getting to know their guests and their preferences, which they can do more easily in the smaller group setting of a private tour. Plus, private tours allow them the opportunity to get creative – perfect for arranging birthday, anniversary and even wedding proposal surprises right out there in Tahoe National Forest! A few housekeeping items that I would like to share to best prepare you for your next snowmobile adventure are: tours accommodate all level of riders, reservations are recommended especially during peak holidays, children must be at least 5 years old and drivers 16 years old with valid driver license and check-in is promptly one hour prior to your tour. Don’t have winter wear? No worries! 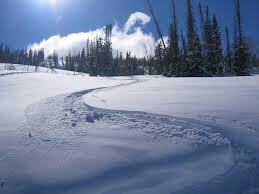 Lake Tahoe Snowmobile Tours has a winter clothing package for an extra $10 for ski jackets, pants and gloves. Helmets and goggles are provided to all riders. 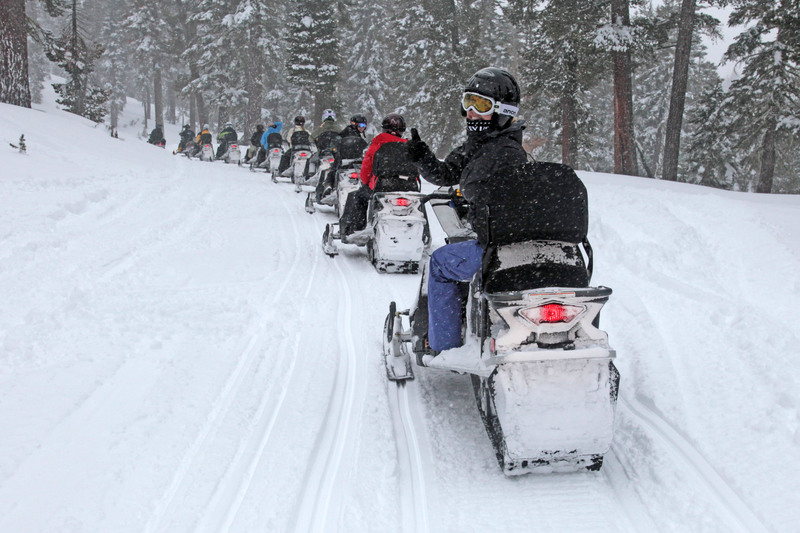 Please share in the comments below if you’re ready to try snowmobiling on your next visit to Lake Tahoe! If you enjoy learning local tips of Lake Tahoe, I invite you to follow my blog and me at @robinpenning on Twitter to receive more information on tips, news, activities and special events in Lake Tahoe. Two days before my wedding in June 2009, I was driving through Incline Village and saw a sign for the Aloha Skin Spa Tahoe and immediately pulled over. At the time I was living in Maui, Hawaii and this caught my attention. I walked in, pleasantly surprised to be greeted by the Hawaiian decor, met co-owner Ashley Holz, booked an appointment and have been escaping to this peaceful and rejuvenating sanctuary ever since. Established in 2007 by Nicoa Wood a former resident of Kona, Hawaii, Aloha Skin Spa Tahoe is a “slice of Hawaiian heaven located in Incline Village in North Lake Tahoe that offers a wide variety of healing services inspired by the essence of Hawaiian culture and its healing elements”. This place has everything! Services range from facials, massages, body scrubs and wraps, waxing, permanent make-up, spray-tanning, specialty packages, bridal and event services, onsite medical skin care, an infrared sauna and more. Having spent almost a decade on Maui, what I love is how much the Aloha Skin Spa Tahoe captures the true essence of the Hawaiian Islands. From the treatments, products, decor and even the personalities of its staff, the spa spreads aloha in everything that it does. After walking into the spa, you feel transported to a Hawaii paradise thanks to the smells of kukui coconut oils and Hawaiian Happy Soaps, surrounded by orchid paintings and sounds of the bamboo fountain and Hawaiian music in the background. After every treatment you are even rewarded with freshly cut pineapple and tea. 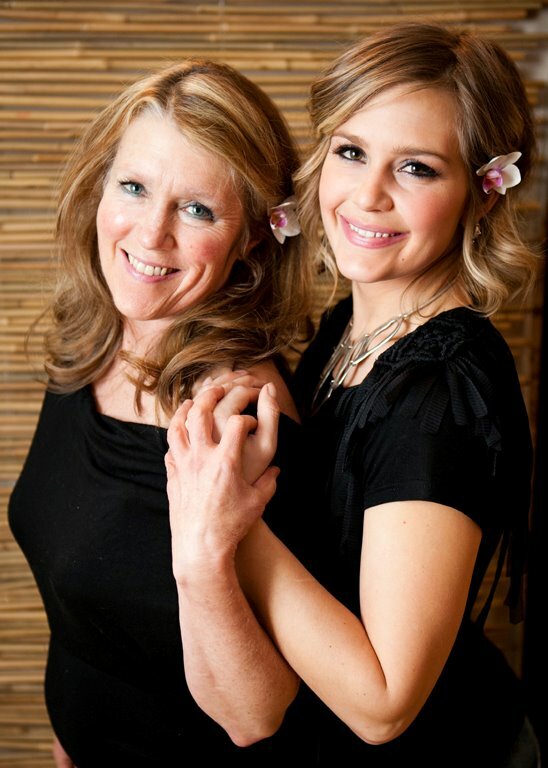 Meet North Lake Tahoe local’s Ashley Holz and Gwendalyn Gilliam who purchased the spa in June 2009 and have operated it ever since. Ashley Holz is an experienced aesthetician and artistic jewelry designer, savy business woman and snowboarder. Born and raised in Lake Tahoe, Ashley has 9 years of aesthetician experience. Ashley’s favorite is the Epicurean Facial which features a high quality warm kukui coconut oil that exfoliates, tones and firms skin all at once followed by an intensively firming mask. Protecting your skin in Lake Tahoe is especially important due to the harsh, dry environment and seasonal weather conditions. And, if you find that your skin needs special medical treatment, Ashley can refer you to Dr. Rebecca Gelber and the services of Tahoe Medical Spa Regenerative Center located onsite. With over 25 years of massage experience, Gwendalyn Gilliam is an intuitive and nurturing healer of both the physical and spiritual ailments of her clients. The result of Gwendalyn’s deliberate and experienced touch is an extremely connective massage between her and her clients. Gwendalyn’s favorite is the Awareness Massage, her own creation which combines physical Swedish or Deep Tissue with deeper energy work and offers an additional blessing to further connect the experience with the divine. Gwendalyn is also a teacher, having created her own massage certification school, a published author and embodies an extremely positive and radiant spirit! Whether you are escaping the winter, prepping for spring and summer or just in need of a pampering let the Aloha Skin Spa Tahoe rejuvenate you. Join their newsletter and receive monthly specials, discounts and event announcements. March specials feature the Green Tea Sea Enzyme Body Wrap and the Kukui Coconut Sugar Scrub and Spray Tan. New specials are announced each month as well as annual events – next is their June Anniversary party! I follow it and love seeing each month’s new special. Enjoy learning local tips of Lake Tahoe? Follow my blog and me at @robinpenning on Twitter to receive information on tips, news, activities and special events in Lake Tahoe. If you’re like me, you get easily bored with routine even when it comes to your winter adventure. The great news is that Lake Tahoe offer tons of fun, unique events to ensure that you get the most out of your trip to the mountain. Here I would like to highlight some local favorites…. First Tracks and Last Tracks! It’s no secret that skiers and snowboarders love the excitement of getting up early, gear laid out, itching to be on the first chair up the mountain to be rewarded by first tracks down the mountain. This ritual becomes especially coveted on a powder day. Resorts like Northstar California and Squaw Valley have created special packages to get visitors out on the mountain BEFORE the resorts even open! Here is a bit more detail on both. First Tracks and Breakfast at Northstar California, recommended for advanced skiers and riders, is offered Saturdays throughout the winter season weather and conditions permitting. For the rest of this season the program will be offered the following three Saturdays: March 9th, March 16th and March 23rd. Tickets are $80 per person and tours start promptly at 7:30am. Guests will head to the backside of the mountain for first tracks. By the time the mountain is opened to the public, you will be enjoying an inclusive breakfast at the Zephyr Lodge. Squaw Valley’s program, Dawn Patrol is available to guest of all ages allowing visitors early access to the resort’s expansive terrain whether it be untouched corduroy or fresh powder depending on the morning. Tickets range from $12-$29 depending on age and special 50% discounts are available to season pass holders. Dawn Patrol is also available every Saturday for the rest of March including: March 9th, March 16th and March 23rd. Let’s be honest, 7:30am on a Saturday canbe pretty tough to swing after a long week at work or a late Friday night. Another exclusive mountain experience is Last Tracks at Diamond Peak in Incline Village. This package only $29 for a late-day lift ticket, gives skiers and riders two hours of access and an invitation to the last chair up the mountain to the scenic Snowflake Lodge. Here guests will enjoy breathing views of Lake Tahoe along with wine, beer and appetizers. Finally, last trackers enjoy a freshly re-groomed trail down the mountain all to themselves. Now that is my kind of Après Ski Experience! Which would you prefer – First Tracks or Last Tracks? Vote for one by sharing it in the comments below. For me personally, it depends on the day. On powder days, definitely First Tracks but for sunny spring days, I can’t of a better way to end a Saturday than with Last Tracks. Enjoy learning local tips of Lake Tahoe? I invite you to follow my blog and at @robinpenning on Twitter to receive information on tips, news, activities and special events in Lake Tahoe. When you think of Lake Tahoe what comes to mind? Often images of clear blue waters and scents of crisp mountain air but what about the clear skies above? Thanks to its high elevation and lack of light pollution, Lake Tahoe sets one of the best year-round star gazing stages. And, it wouldn’t be a star gazing experience in Lake Tahoe without an adventure so here we like to explore the winter skies by snowshoe! Snow shoeing is one of my favorite Lake Tahoe winter activities. There is something unique about snow shoeing that makes it unlike any other winter adventure. To me, its the combination of great exercise amongst the serene background of winter’s serene and peaceful beauty. Plus, the floating feeling you get when walking on fresh powder after a storm is something everyone should enjoy! The best part is that snowshoeing can be enjoyed by people of all ages, athletic ability and can be a convenient and inexpensive activity. Even bring your dog and enjoy it with the whole family. Meet Tony Berendsen. I had the pleasure of meeting Tony a few years ago in a presentation to my office and afterwards at one of his summer Stargazing Tours at Northstar California. Besides being the past President of the Astronomical Society of Nevada and President of the Nevada Science Coalition, Tony is the most passionate, fun-loving and creative star guide I have ever met. With more than 15 years of experience with the Lake Tahoe skies, he is the founder of Tahoe Star Tours. And, this is no ordinary star tour. Every tour offers a different interpretation of the starry skies and is accompanied with poem readings written by Tony himself, fun space quizzes along with laser and telescopic tours of the night sky. And if that wasn’t enough, enjoy his tours by the cozy fire pit with wine and hot beverages. Where do I sign up? First, I recommend the Stargazing Snowshoe Tour at Northstar California hosted by Tony. 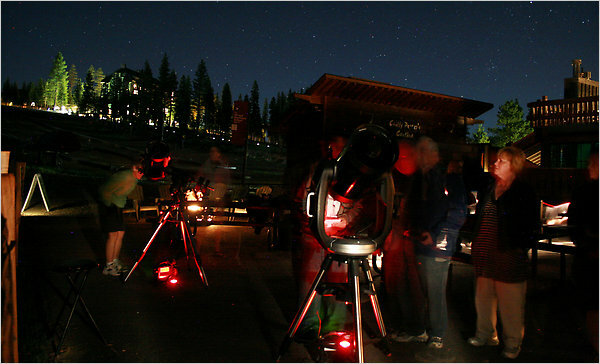 Stargazing Snowshoe Tours meet at the Cross Country, Telemark + Snowshoe Center at Northstar California, last 2-2.5 hours and offered once a month. Guests are lead by Tony along snowshoe trails while learning about the starry skies above. Halfway through the hike, guests head to the Cross Country, Telemark + Snowshoe Center to gather around the fire pit and enjoy a laser tour, telescope viewing and hot beverages. Once you’ve become a newly found star tour expert, a group snowshoe hike leads guests down to the Village at Northstar where you can grab a bite to eat, cocktail and relax around the outdoor fire pits. Or you can meet Tony and enjoy snowshoe star tours and full moon snowshoe tours while trekking through the forest in Tahoe Vista with the adventure experts at Tahoe Adventure Company. Even though there are only a few more months left this winter, the star tour adventures continue into the summer accompanied by hiking, kayaking and even a live string quartet! More on these additional star tour opportunities to come! I think the star tours led by Tony are a unique exploration of Lake Tahoe. If you have a favorite unique activity that explores Lake Tahoe in a different way or if you would like to try star tours please share it in the comments below. Enjoy learning local tips of Lake Tahoe? I invite you to follow my blog and follow me on Twitter at @robinpenning to receive information on tips, news, activities and special events in Lake Tahoe. I am a Lake Tahoe local, living in beautiful North Lake Tahoe. I am passionate about travel, especially the discovery of unique destinations, foods and activities uncovered through interactions with locals living in these destinations.